At least for a little while. But what will the iWatch look like? 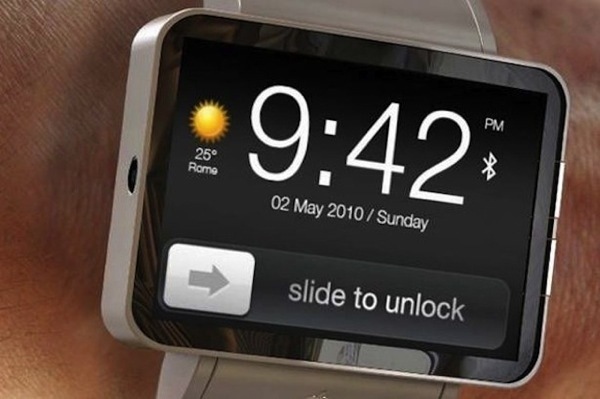 What will the Apple “wristwatch” do? For the nearly one-in-five consumers that say they will buy an iWatch sight unseen, it really doesn’t matter – they have faith in Apple and its ability to design new, innovative products. ChangeWave surveyed more than 1,700 consumers, mostly in North America, and discovered something surprising — although no one knows what the it will look like let alone what it will do, people believe in Apple and want the iWatch. “[D]riven in large part by Apple’s track record of delivering ultra-convenient, easy to use, innovative products with a perceived ‘cool factor,’” 19 percent of surveyed consumers told ChangeWave they will buy the iWatch. Further, the breakdown is more intresting still — whereas 5 percent say they are likey buyer, 14 percent say they almost certainly will buy an iWatch. And, honestly, Apple has earned this level of faith — the original Mac, PowerBook, iMac, iPod, iPhone, MacBook Air and iPad were all well ahead of their time when released but all went on to define and dominate their respective product categories. Yes, there are have been some notable failures — Newton, G4 Cube, MobileMe — yet Apple as innovator has an unrivaled track record. 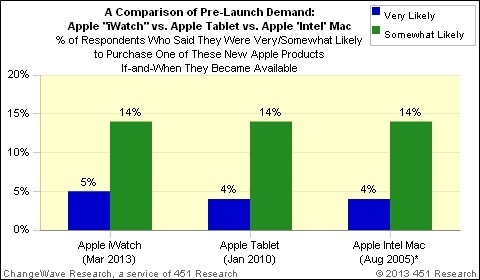 Are you ready to buy the iWatch?